9:02 p.m. -- Israeli rescuers pulled a 22-year-old man from the ruins of a three-story building in Port-au-Prince on Friday, 10 days after the January 12 earthquake. The man, who was not immediately identified, was rescued near the quake-ravaged presidential residence south of the capital, according to the Israel Defense Forces. The rescuers "were able to release him whole and healthy" and take him to an IDF field hospital in stable condition for further treatment," Maj. Zohar Moshe said. 7:39 p.m. -- Haitians have to be in the driver's seat as they try to rebuild their country, the head of the International Monetary Fund says. 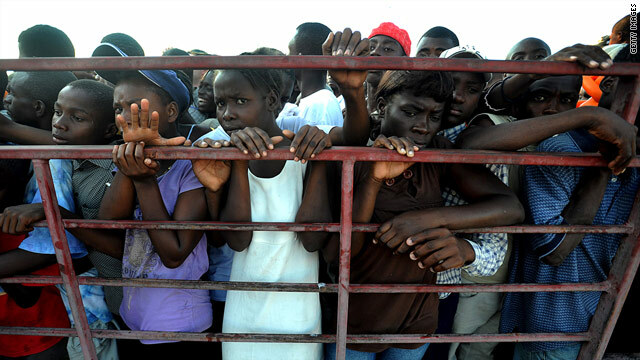 "We can provide resources, but there must be ownership by the Haitians themselves and especially by the Haitian authorities," Dominique Strauss-Kahn told CNN's Christiane Amanpour. He previously has called for some kind of Marshall Plan like the one that rebuilt Western Europe after World War II. 7:10 p.m. -- About 4 million pounds of food are being sent by barge from Puerto Rico to Haiti, CNN's Mike M. Ahlers reports. Puerto Rican authorities say that when it arrives in Haiti on Monday morning, it will be the single largest shipment of aid to arrive there to date. The food is said to be enough to feed the people of Port-au-Prince for a week. Organizers say it would take 150 planes to carry as much cargo. 6:42 p.m. -- About 250,000 people in Haiti are in urgent need of aid and another 3 million have been affected, according to the European Union, whose commissioner for development and humanitarian aid, Karel De Gucht, got a firsthand view of the situation in Port-au-Prince this week. The EU has estimated the death toll in Haiti to be at 200,000. 1:39 p.m. -- The international aid organization Partners in Health reports it has 24 operating rooms established and working 24 hours a day in Haiti. More than 140 surgeons, nurses, anesthetists and other specialists were involved in the organization's quake relief effort, it said. 1:20 p.m. -- CNN's Ivan Watson speaks to a fisherman in Petit Paradis, Haiti, who describes a tsunami from the 7.0-magnitude earthquake more than 12 feet high. The water swept away his father and at least three other people in the fishing village, the fisherman tells Watson. 12:24 p.m. -- As of Thursday evening more than $355 million in donations had been raised for relief efforts, according to the Chronicle of Philanthropy, a newspaper covering nonprofit organizations. The estimate is based on a survey of 35 charities contributing the largest amounts of money to Haiti. 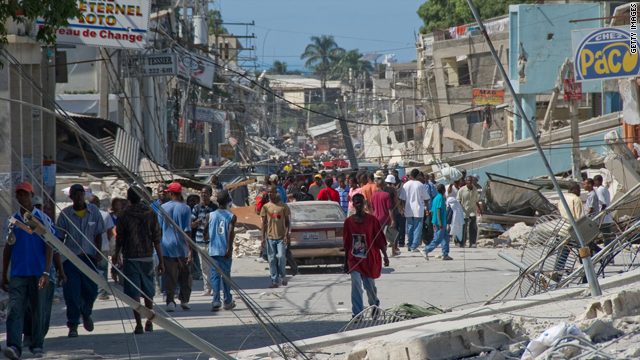 11:57 a.m. -- Corporate donations to Haiti earthquake relief have surpassed $100 million, according to the U.S. Chamber of Commerce's Business Civic Leadership Center. The center reports the $106 million donated so far is the fifth-largest corporate response to a natural disaster ever, trailing only hurricanes Katrina and Rita in 2005, the 2004 Indian Ocean tsunami, and earthquakes in Kashmir (2005) and China (2008). 10:18 a.m. -- The International Organization for Migration reports that as of Friday 508 makeshift settlements have been identified in the area of Port-au Prince. 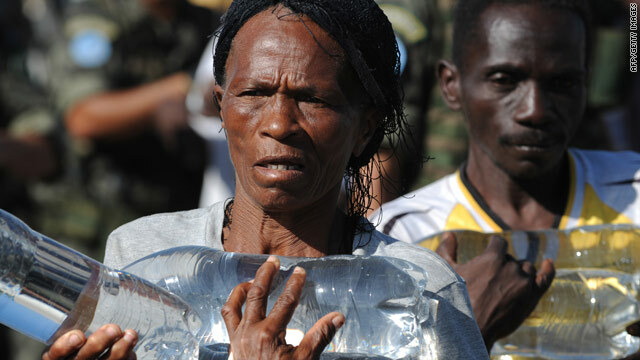 Surveys by the organization and the Haitian government of 314 of those settlements put their population at 472,000. 7:54 a.m. -- The U.S. Geological Survey reports a 4.4-magnitude aftershock strikes about 15 miles north-northwest of Port-au-Prince. Depth was about 6 miles. 6:40 a.m. -- Authorities pushing to clear earthquake-relief bottlenecks in Haiti continue to work Friday to improve the flow of relief supplies at the south pier in Port-au-Prince. The January 12 quake damaged the capital's north and south piers. Haitian authorities and the U.S. military had restored one-way traffic to the south pier, which is the smaller of the two, by Thursday. Port-au-Prince's north pier remains unusable.